Home » Doing Business in St. Marys » Where Is St. Marys? St. Marys is located in Auglaize County in West Central Ohio. It is conveniently located adjacent to US 33 and only ten miles to Interstate 75 to the east. This strategic location to interstate makes St. Marys easily accessible to profitable markets and attractive for businesses. More than 63% of the manufacturing facilities and 80% of US Corporate Headquarters can be reached by highway transportation in one day. 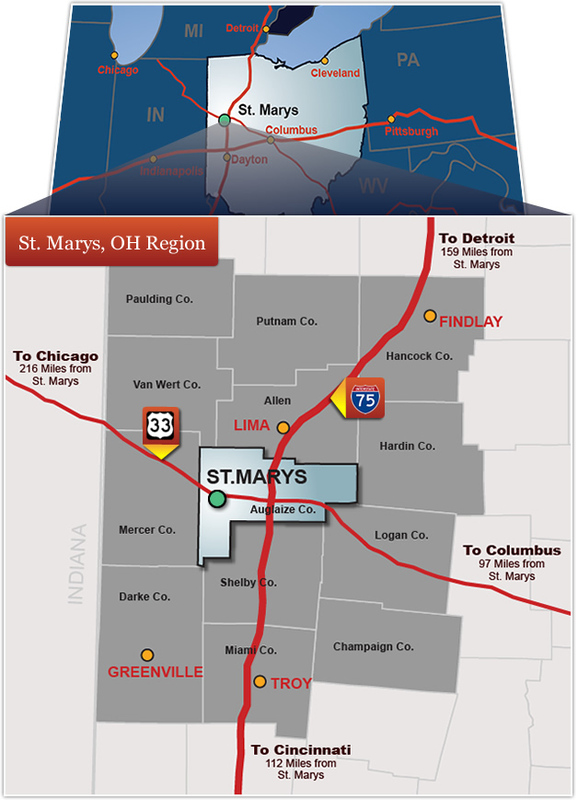 St. Marys is well positioned among the major cities of Toledo, OH; Columbus, OH; Dayton, OH; and Ft. Wayne, IN. St. Marys's land area totals 4.4 square miles (7.08 kilometers) and consists of a highly developed urban area, and undeveloped agricultural land.